For a carbaholic like myself, there aren’t too many things that can top a cheesy loaf of bread. All you need to do is watch how quickly I can devour things such as pepperoni bread, my grandma’s bacon and cheese bread, cheesy breadsticks with pizza, and the list goes on and on. Suffice it to say, you can’t put bread and cheese in front of me and not expect me to inhale it like I had just suffered the rigors of one of those survivor men shows. 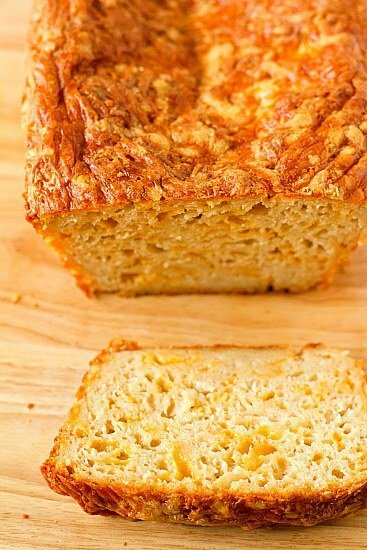 A few years ago, I made a three cheese beer bread that was darn near awesome. It had loads of cheese, tons of flavor, and, of course, beer. 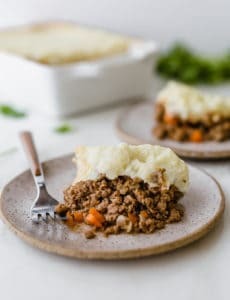 Last year, Krissy over at Make It Naked gave me a heads up that she had adapted my recipe to make it Irish-themed for St. Patrick’s Day. Brilliant! I loved her version and couldn’t wait to give it a try myself once the holiday rolled around again. So, here we are! 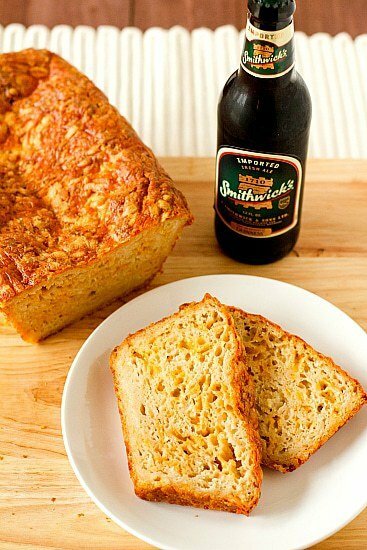 This is an amazing loaf of beer cheese bread that includes Irish ale as well Dubliner, an Irish cheese spiked with stout that adds a really nice tang and sharpness to the bread. It’s a perfect way to work Irish beer into a recipe that doesn’t necessitate busting out any Guinness. I found Smithwick’s at the local grocery store, but if you have a particular favorite, feel free to use it, just make sure that you use an ale, not a stout. A stout would be too heavy and overpowering in this recipe. 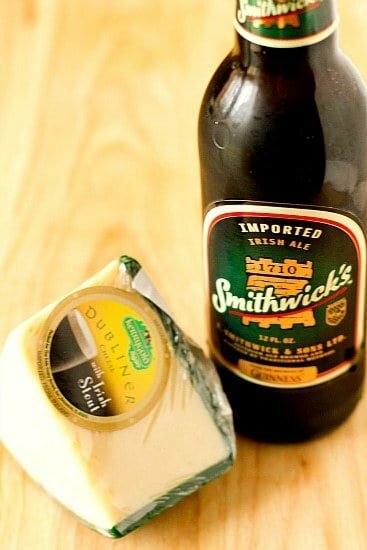 I found the Dubliner cheese in the specialty cheese section of the local grocery store. If you are unable to find any Irish cheese just increase equal amounts of the other two cheddar cheeses. This bread is heaven, in a nutshell. Aside from all of the cheese and the beer, it has robust flavor and just a hint of spice. It’s the perfect backdrop for endless variations depending on your personal tastes. I am already brainstorming some ideas for an Italian version of the bread that I can’t wait to share with you. In the meantime, I encourage you to bake this up for St. Patrick’s Day tomorrow. It would make a fabulous breakfast bread. You know, to eat alongside your first green beer of the day. Preheat oven to 350 degrees F. Grease a 9×5-inch loaf pan and set aside. Measure out ¼ cup of the sharp cheddar, ¼ cup of the white cheddar and 2 tablespoons of the Dubliner and reserve for topping the bread later. In a large bowl, combine the remaining cheese, the flour, baking powder, dry mustard, salt, cayenne, white pepper, and garlic. Stir to ensure that all of the cheese is coated with flour. In a small bowl, whisk together the beer, sour cream, egg, and Worcestershire sauce. Pour the beer mixture into the cheese and flour mixture. Use a wooden spoon or spatula to mix the dough until just combined. 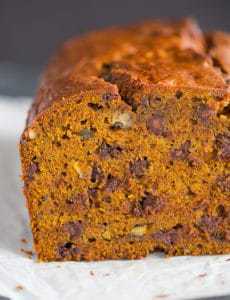 Spoon the dough into the prepared loaf pan, using a spatula to even out the top. Mix together the reserved cheeses and sprinkle evenly on top. Bake for 55 to 65 minutes or until a knife inserted into the center comes out clean (or, if you have an instant-read thermometer, the middle of the bread reaches 190 degrees F). Remove bread from the oven, place on a wire rack, and cool for 10 minutes. Run a knife along the edges of the pan and continue to cool. When the bottom of the pan can be touched, turn the bread out and let cool completely on a wire rack before slicing. I just made this bread. It was very dense and collapsed. (The picture of the bread on the web site appeared collapsed too.) Baked over 65 minutes, knife came our clean. The recipe calls for 20 ozs. of cheese, part of it for the topping. I converted 3 1/2 cups of flour to weight is 14 1/3 ounces. I only used 8 ounces of cheese and still was too much. Bread smelled good. I would suggest no more than 2-3 ounces of cheese. Worth trying again with less cheese. I made this bread last night and it is GREAT! I subbed 1 and a quarter cup for whole wheat flour and left out the Dubliner cheese because I didn’t see it at my supermarket and was too lazy to look elsewhere for it. I left everthing else the same (I even used Smithwick’s!) and its perfect. 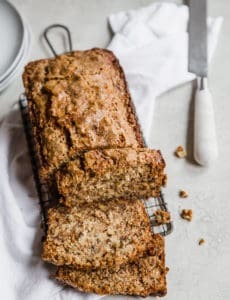 I’m sorry to hear others had problems with it being too heavy :( This recipe definitely makes dense bread, but it has a lot of baking powder in it, so maybe it has to do with old or expired BP? I almost never finish a can before it has to be replaced. Just a thought! Unfortunately, I have to agree with some of the other commenters. Was excited to make this today, and it smelled SO good in the oven! But the bread was really heavy and dense, and just didn’t turn out right. I baked it 65 minutes, then tested with a paring knife. It just never quite came out clean, even after an additional 30 minutes in the oven. I finally pulled it out because the top and edges were getting very brown. When I sliced into it after it cooled, the top was a puffy delicious cracker, and the entire bottom was a dense, heavy, doughy mass. Delicious flavor, but the texture was all wrong. Baked to take into work to celebrate St. Patty’s Day. Guess I’ll be sneaking toasted ugly delicious bits at home instead! Just pulled this out of the oven and it is DELICIOUS! 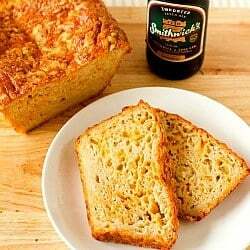 The best beer and cheese bread I have ever made. I didn’t find it to be heavy at all.